We don't allow our kids to wear shoes in our house. Likewise, we don't wear any either. Growing up, my parents had the same rule. When I visit there now, I still need to take off my shoes. Really, it's no big deal- except for the fact that my feet are always cold. Sometimes I wear socks, but when I'm visiting anyone with hardwood or laminate floors, socks can be dangerous for this clumsy girl. I have thought in the past of carrying a pair of slippers with me, but let's get real here. Who wants to carry a bulky pair of slippers with them when visiting family and friends? Not me. No way. My purse is full enough! When I came across Valkin Threads on Etsy, I was immediately drawn to the slippers Sara makes and sells. Not only are they absolutely adorable, they're also practical. We agreed to review of a pair of slippers, and Sara sent me the cutest pair I have ever owned. 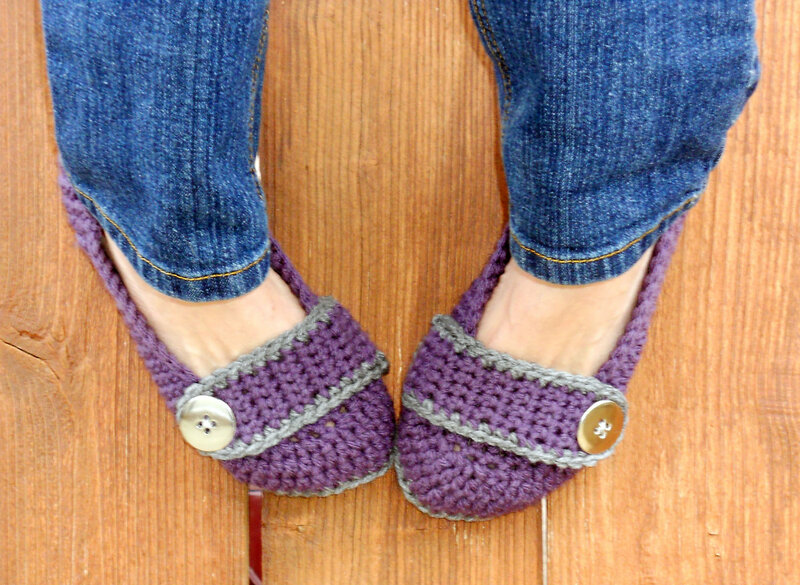 They are grape and gray in color and have a crochet strap in matching yarn that is attached across the top of the slippers and fastened with a large silver button. The bottoms of the slippers have a grippy material to keep clumsy people such as myself from slipping on slick floors. Aside from how cute they are, I love that these slippers are portable. I keep them in my purse so I have them anytime I need them for keeping my tootsies warm and comfortable. Rolled up, they take up hardly any space at all in my bag. Sara, owner of Valkin Threads and creator of all the amazing items in the shop, got her start accidentally. One night she was playing around with a crochet design and by morning, had a pair of arm warmers which became the initial item in her Etsy shop. They sold like crazy, and eventually, Sara added other items to the store. I must say, I am happy for the accident that created Valkin Threads! I intend to be a repeat customer! If you are in need of a gift for your daughter, mom, best friend, or actually ANY female, Valkin Threads is a must buy! You will fall in love with many of the items in her Etsy shop. Connect with Valkin Threads on Etsy, Facebook, and Twitter. Valkin Threads offers a variety of reasonably priced trendy styles like boot socks, fingerless gloves, headbands, leg warmers, slippers, and so many other cute unique items. Go holiday shopping to get a gift she is sure to love. 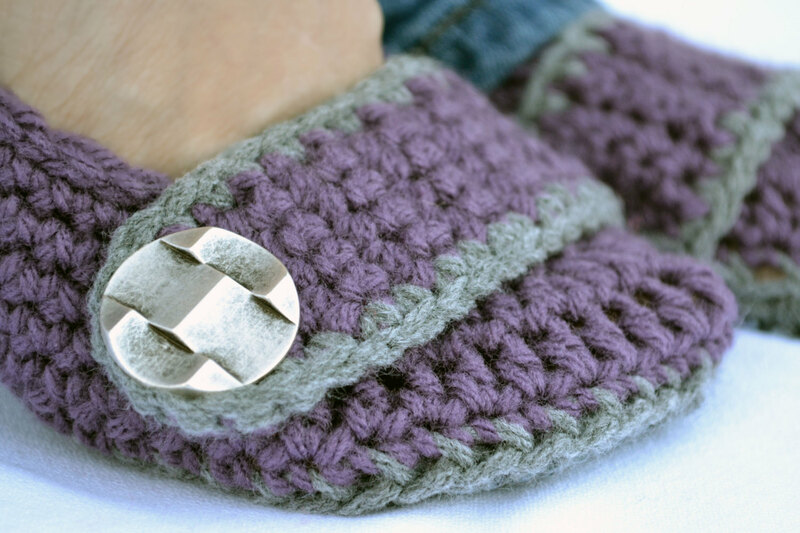 Valkin Threads is generously offering one lucky reader a pair of the Stormy Weather Slippers. 2. Enter in the giveaway widget below. This giveaway is open to residents of the US , 18+. 3. You MUST visit and "Like" Valkin Threads on Facebook . Once you do that, come back her and let us know. 4. Earn extra entries for sharing this giveaway on Facebook, Twitter, Google+, Instagram, and Pinterest. Be sure to use #lifelifereviewsholidaygiftguide2015. Then, come back here and leave us a post so we know you shared. I love Valkin Threads. I already like the page on Facebook and it is one of my favorite stores on Etsy. I own a beautiful pair of fingerless gloves that I bought through the Etsy store, and I constantly receive compliments. I have been eyeing a pair of these slippers for a while now, and may just have to give myself an early Christmas present! Sharon- The slippers are a definite must-have item! So comfy! 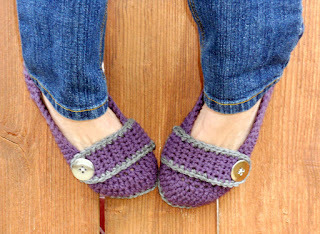 Thise are such beautiful slippers and I love the color of the ones pictured. Absolutely love these slippers! They look so soft and cozy. These slippers are so cute and i love the color! Cute slippers, they'd make a nice gift! These are super cute. Great Christmas present gift for pretty much anyone too. The Slippers are awesome. I love the way you accidentally got started - the Arm Warmers are great. The slippers are really cute and I need a new pair really bad. oh my goodness! these are so cute! I would love these! Nice slippers. They would make a great holiday gift. These slippers look so comfy and I sure love the look of them! These are some really unique-looking slippers! wow, these are so cute, I crochet some and am loving the way these are made. These look super cute and so cozy! Just what I would need for the winter months. I'll be sure to share on FB! Thank you for the giveaway.